Div.1 will be thinking about those games that were winnable, the ones that got away. Div.2 is gearing up for another final's campaign as they cast their eyes on back-to-back campaign. Here's a look at both game from the weekend. Pushing for an unlikely finals berth, Div. 1 finished off the regular season with a convincing thumping of the High Park Demons by 100-points on Rogers TV. Unfortunately, it was not enough as an Etobicoke Kangaroo victory in Hamilton sent the 'Roos through to the finals which made sure Div.1 didn’t play finals in 2014. A 16-per-side match, the Dingos were able to dominate the centre of the ground, as has been the case much of this season. Strong work by on-ballers Tom Humphries (six goals) and Shaun McKay kept the footy moving forward out of the middle. Big Butch up front had plenty of opportunities on the day, bagging another four goals. In the backline, Steve Gordon was solid at centre-halfback, keeping the Demons' opportunities to a minimum. 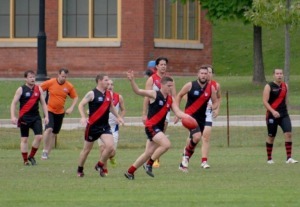 A 40-point lead at quarter time was expanded to 60 by halftime as the Dingos' attack continued. Up forward Big Butch, Humphries, Big George and Mick (two goals) all worked hard. It was a solid team effort for four quarters that allowed the boys to cruise home with a 100-point victory. The win was bittersweet, however, as the boys learned that their efforts would not lead to an opportunity to play finals in 2014. Coach Robbo congratulated the boys on a solid win and urged greater commitment for the fight for the flag in 2015. The win also marked 50 games for dual BOG captain Shaun McKay and Tom Humphries who both had solid games across the ground. 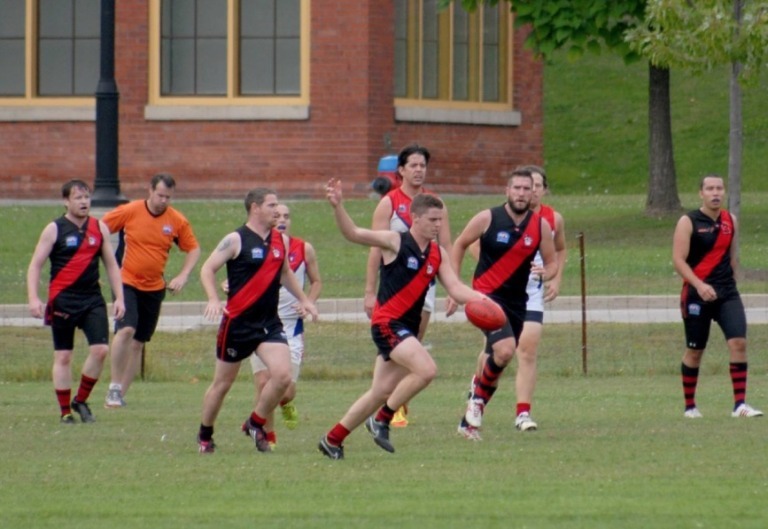 Div.2 recorded a forfeit over the High Park Demons at Humber South on Saturday. A forfeit is recorded as zero premiership points to each side and is played as a friendly match. Regardless of the result, Div.2 were destined for finals as all five teams made finals in 2014 (as the Roos pulled their team out of the competition early in the season). With that, Div.2 scored a 75-12 result in the friendly as Paul Tinkler , Rainer Haycraft and George Craig got plenty of the ball in the two 15-minute halves of football. Steve Gordon and Mick McFarlane were also in the thick of it. Div.2 finished the season in second position on the 2014 AFLO standings as they now go about defending their title with back-to-back flags. They will take on league leaders Toronto Rebels on Sept.6 at Humber South where the winner will advance straight to the Grand Final.